Like the churches in Ithaca, New York, the best houses of worship in Albany are concentrated in a small area of the downtown. Visiting the five best ones requires a walk of only 1.5 miles. They’re at least 100 years old and constitute a striking visual narrative of the city’s religious history and communities. These are my favorites. In the heart of downtown Albany, the Cathedral of the Immaculate Conception boasts an impressive historical record as the first American Catholic cathedral built in the neo-Gothic style, the second-oldest cathedral in New York (after St. Patrick’s in New York City), the third-oldest in the United States, and the tallest building in Albany when construction ended in 1852. The cathedral escaped the wholesale razing of the surrounding neighborhood to create Empire State Plaza and stands in stark contrast to the banal modernist office towers across the street. 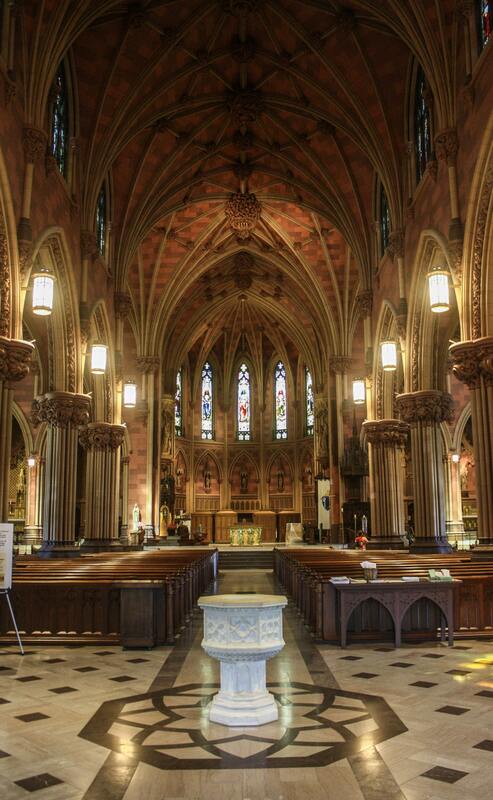 The brick, sandstone, and plaster cathedral occupies a corner lot and features two spires that top out at 210 feet. I entered the magnificent interior through the middle of three portals and was immediately drawn to the exceptional sculptural arrangements of the Stations of the Cross, which won the Gold Medal at the 1888 Paris Exposition. There’s plenty more to be awed by: The Last Judgment Window was made in England, the oak high pulpit was hand-carved in Holland, and the oak choir stalls were carved in Belgium. You’ll also find a Caen stone baptismal font and the regal Cathedra — the bishop’s chair. Clustered columns with heavy capitals of organic motifs, including lots of grapes, grape leaves, and grape vines, support the vaulted ceiling with heavy bosses. The cathedral also holds my favorite depiction of Palm Sunday, a stained-glass window displaying the full spectrum of colors. 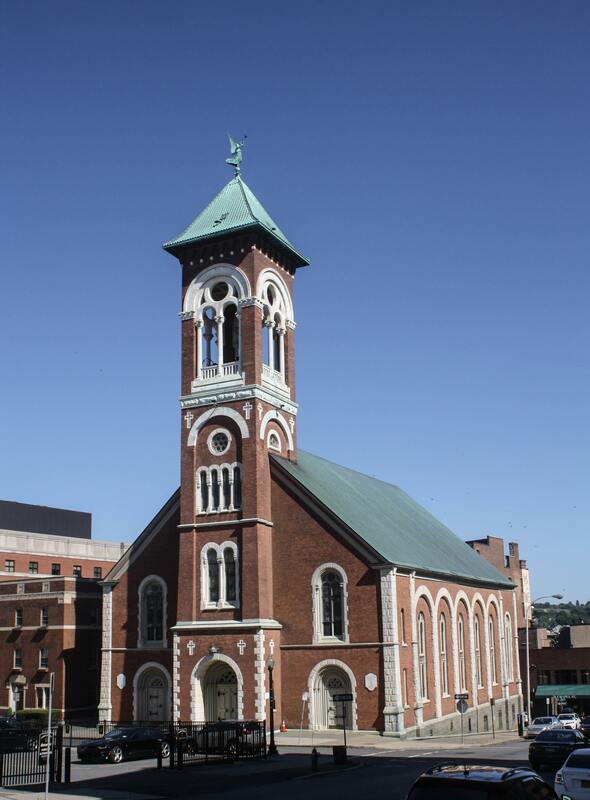 Designed in the Romanesque Revival style by a local architect, St. Mary’s Roman Catholic Church went up in 1870. Shortly after, electric lighting was installed — the first among the city’s churches. The 175-foot open bell tower was added in the late 1870s, topped by a statue of St. Gabriel the Archangel, blowing a trumpet and functioning as a weathervane. Inside, an upper-story horseshoe-shaped gallery running around the sides and back, supported by clustered columns, opens up the space, giving plenty of breathing room and the chance to view the ornate ceiling close up. Two angels flank a clock from 1797, and the Baptismal font is made of white carerra marble, pewter, and silver. The Stations of the Cross, carved in Bavaria and dating from 1862, ring the walls between fine stained-glass windows and excellent murals and contain a little secret: If the plaques with the English descriptions at the bottom of each Station were to be removed, the original German would appear. One of my favorite architects, the great Richard Upjohn, designed the lovely St. Peter’s Episcopal Church in the French Gothic style in 1876. The asymmetrical façade of this National Historic Landmark features a rose window designed by Tiffany in 1890 and a 180-foot-tall tower with turrets, three-ton gargoyles, and three lancet windows on each side, gracing State Street, downtown Albany’s main drag, with one of its most striking buildings. Inside, a series of arches sustain the clerestory, rising from octagonal stone columns. Above, a beautiful wood ceiling is a masterwork of tracery, and the vivid stained-glass windows bathe the interior in colorful light. My favorite feature unfolded beneath me. 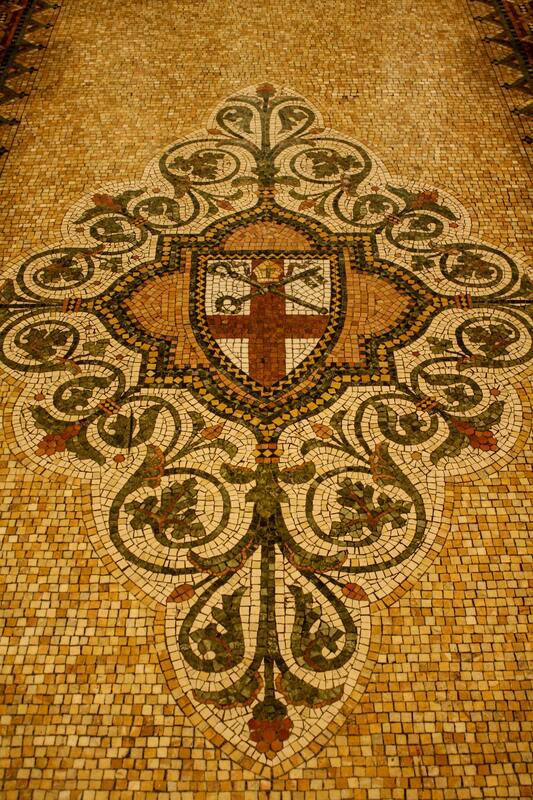 The gorgeous mosaic flooring throughout the church bears both straight-out messages (“I am the vine, ye are the branches” and the Ten Commandments) and elaborate Christian symbolism, such as an anchor (representing hope), a pelican (redemption), and a lamp (good works), as well as shields holding the traditional symbols of the 12 apostles and of St. Stephen, David, St. Paul, and Moses. Designed as a High Gothic cathedral similar to those in Europe in the 11th and 12th centuries, and constructed with the same materials and methods, The Cathedral of All Saints was “completed” in 1906 as the first Episcopal Cathedral church in the United States built expressly as such. But the cathedral didn’t fully achieve its much larger designs: Adjacent land purchased in the interim by other parties prevented that, and subsequent development around it has ensured that it never will. Despite falling far short of its aspirations, it still stands at 320 feet long and 130 feet wide, making it the fifth-largest cathedral in the United States (and 29th largest in the world). The cavernous interior features fantastic stone carvings, a beautiful rose window designed by John La Farge, and choir stalls from 1655 that were salvaged from a demolished church in Bruges, Belgium. Rather than marble or white limestone, brownstone was selected for the pillars, a choice that deliberately made the space look and feel old, even when it was new. The walls of the side aisles are hung with small and extremely simplified Stations of the Cross, but there’s nothing small or simple about the Great East Window. Crowded into the window are saints of early Christianity and the Church of England as well as key events in the lift of Christ, including the Resurrection and the Ascension. 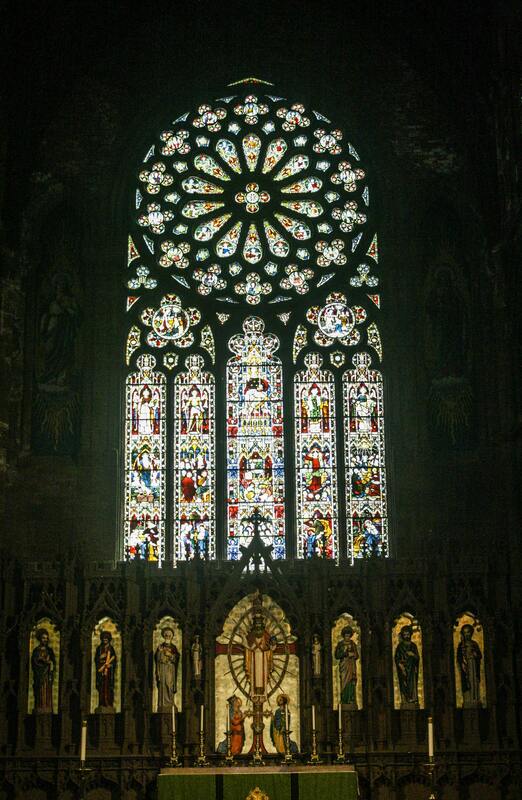 More than 40 feet tall and 22 feet wide, it’s one of the largest stained-glass windows in the world, and when it’s backlit by the morning sun, the lucent window glows with heavenly light. 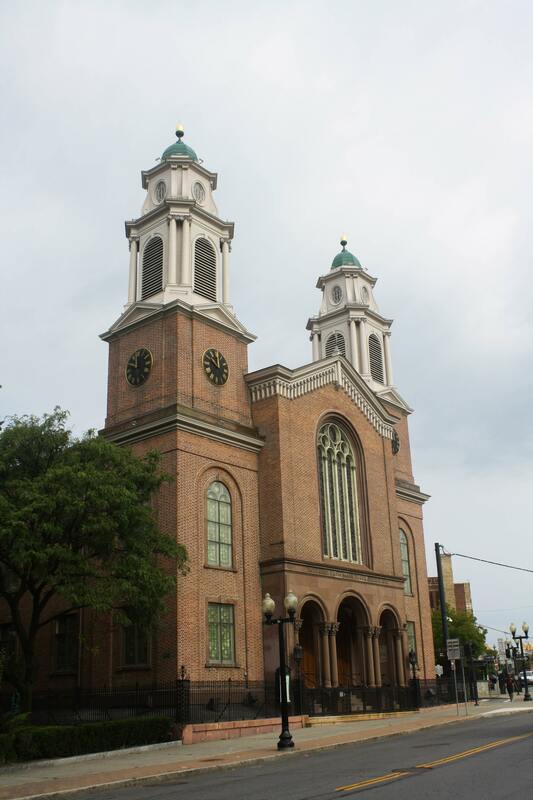 The handsome twin bell towers, long a key component of the Albany skyline, guided me to the First Church of Albany. Disappointingly, the church was closed and wouldn’t open for hours until its next service. Hoping to tap another case of upstate New Yorkers’ hospitality, I popped into the office and asked if it would be possible to look around. They were more than happy to open the church just for me and escorted me around on a short tour, during which the guide pointed out four key highlights of this 1798 church: its “Lily Among the Thorns” wall painting; the pew of Theodore Roosevelt when he served as New York’s governor; the balcony, intended for use by slaves; and, most importantly, the oldest pulpit in the United States, handcarved in and imported from Holland in 1656. She showed me how to turn off the lights in a back closet and left me to explore at own pace. On my way out, as she was escorting three firefighters in for their own turn around the building, she pointed to “The Summer Window,” a virtually priceless 1912 Tiffany beauty.